Highly flexible, fully responsive, standard-driven codes and packed with awesome features – everything you need for your business or personal sites. 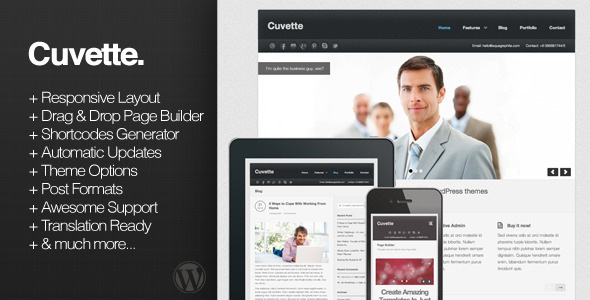 Cuvette is our response to the high demand for quality themes that not only look good on the front-end, but also friendly enough in the back-end to work with. Built with the highest attention to details and coding standards, you will be amazed at its solid performance & limitless customisation possibilities. Responsive Design – From desktop to mobile, the site scales gracefully to optimum resolutions of any modern devices. Don’t need this feature? Just turn it off from the options panel. Page Builder – Drag and drop, super flexible and highly intuitive, with UI that feels like home with WordPress. Build amazing templates in just seconds with over 20 custom blocks to choose from. Theme Options – Want to turn off a feature you do not need? Need to customise the typography, backgrounds etc? We all have that figured out and made it a breeze for you to fiddle with. Shortcodes Generator – Tonnes of shortcodes do not mean a thing if you don’t have a clue on how to make use of them. We equipped the theme with a shortcode generator right in the post editor to quickly use the shortcodes. Check out some of the available shortcodes here. Automatic Updates – No more going back and forth to Themeforest to download and update the theme. With our custom API to update the theme, the latest version available is only a click away, right in your dashboard. Awesome Support – We pride ourselves with our themes, and we want to maintain good relationships with all of our customers. If you have any issues with the theme or having difficulties with some of its features; You’re more than welcome to contact us from our profile page and we’ll reply to you as soon as humanly possible! Self Hosted Audio & Video for Posts & Portfolio Formats – Looking to quickly uploads your audio and video files? Use our built-in players and we’ll style it to match. Drag and drop Portfolio Sorting – You can manually re-arrange the order of your portfolio items, no plugins required! Unlimited Sliders – Display your beautiful images in a slider gallery anywhere you like with our responsive & sleek FlexSlider-powered solution. Backup & Restore Options – Quickly transfer/backup all your theme options data between different installs, useful for experimenting with the stylings or moving from one WordPress installation to another.